Icheb was Brunali - an agrarian society with limited technological resources. Their homeworld was located at the mouth of a Borg transwarp conduit in the Delta Quadrant. Frequent attacks by the Borg had left Icheb's homeworld, which once used to be home to a technologically advanced space-faring civilization, in devastation and ruins. In order to prevent further Borg attacks, the few enclaves that had remained scattered along the northern continent had adapted to an agricultural lifestyle with little technological resources, as they believed their lack of advanced technology would stop attracting more Borg cubes. However, Icheb's people had developed sophisticated techniques in genetics so they could create crops that would grow in even the most unsuitable of climates. His parents subsequently used their knowledge of genetics as a tool to stand up to the Borg. They genetically engineered Icheb to be born with a deadly pathogen that was destructive to the Borg and sent him in a small ship towards the transwarp conduit. A passing Borg vessel discovered him and he was assimilated. Being too young, Icheb spent several months in a Borg maturation chamber before he was prematurely released, due to the virus he had carried with him and which had resulted in all the adult drones aboard the cube dying. Icheb found out only after he was re-united with his family again what the true purpose of his existence was and what his parents had done to him. Icheb was named after his father, whose middle name was Icheb. Poma, a Brunali delicacy, was Icheb's favorite food as a child. His father told him that he also used to be quite an athlete. As a Borg drone, he was given the designation of "Second", as he could not control the other drones, even though he had emerged first from the maturation chamber. When Seven of Nine first encountered him on the Borg vessel, Icheb did not have much of a memory of his past and his family, even though he could remember selected information about them, such as his mother's hair color. Even though Icheb was "Second" in command, he eventually asserted himself against the "First" who had established a hierarchy on board the vessel, controlling everyone and even going so far as to attempt to capture USS Voyager. After these attempts failed, four of the five adolescent drones were adopted by the crew of Voyager. The Doctor was able to remove most of their implants and the four adolescents began a period of re-integration while on board Voyager. Seven, who initially questioned whether they could be transformed into individuals, took it upon herself to help them on their journey. She began tutoring Icheb and the others, trying to help them adjust to life outside the Collective. Icheb was especially intelligent and innovative: he once sculpted a 26-sided polyhedron comprised of hexagons, octagons and squares. He also had a strong interest and prodigious ability in astrophysics and hoped to work alongside Seven in Astrometrics. At the same time, however, he was also shy and very reserved. When Seven took charge of the children, including Icheb, she was not always able to control them as she wished. Icheb and the others often rebelled and showed signs of insubordination and, as children are, they became increasingly harder to control by the kind of rigid methods Seven employed. Her regimented control of them filled with activities schedules, punishment protocols, orders and threats of reprimand for every little act of insubordination not only made them feel more like drones back on the Borg cube rather than individuals, but it also resulted in a lot of friction between her and the children. Icheb was especially infuriated by Seven's controlling behavior; even though he had a rather gentle and non-confrontational nature, he once became so frustrated with her ordering them around, that when she punished him by asking him to adhere to "punishment protocol Nine-Alpha", he asserted himself by refusing, yelling at her for never letting them do what they wanted, and walking out. This gave Seven a chance to rethink her attitude and approach and she began giving the children some leeway and finally started treating them as the individuals they had become. Icheb once demonstrated his genius-level aptitude for astrophysics to Captain Janeway, Seven of Nine, and B'Elanna Torres by designing a gravimetric sensor array that was capable of being used in conjunction with Voyager's sensors to detect wormholes. However, when his parents and their homeworld were located in 2376, that promising service aboard the ship was apparently terminated. He was returned to them, despite serious objections by Seven. Back on his home planet, he tried to find his roots and adjust to his new life in the culture of farmers without access to much technology and starships. After Voyager left, he finally learned the truth about his initial disappearance and the circumstances surrounding his assimilation, as his parents again put him aboard a small transport vessel headed towards the transwarp conduit in order to finish what they had started. Fortunately, Seven's suspicion about Icheb's parents and constant questioning of his safety led her to expose their plan to sacrifice Icheb, and Voyager returned, rescuing him from re-assimilation. With no home to return to, Icheb rejoined the ship on its journey back to the Alpha Quadrant. After contemplation upon his return, he decided to expand his expertise to include genetics as a way of reconnecting with and honoring his people's way of life. Even though Seven was upset at what his parents had planned to do with him, Icheb had a little bit more understanding for them, stating that they only wanted to protect their species. Seven reminded him that what they did was wrong and that Icheb had to find his own way and realize that as an individual he had a right to determine his own destiny. When in 2377 Voyager was finally able to locate the homeworld of two of the children, Azan and Rebi, Icheb – unlike Mezoti – decided to remain aboard Voyager and not join them. Shortly after the children left, Seven's cortical node started malfunctioning. Experienced in Borg technology, Icheb realized that only a node from a living drone would save her. Possessing a strong aptitude for astrophysics, Icheb also finally attained the post in the astrometrics lab and eventually expressed his desire to apply to Starfleet Academy to earn his commission, now that Voyager had established a regular data-stream communication with Earth. 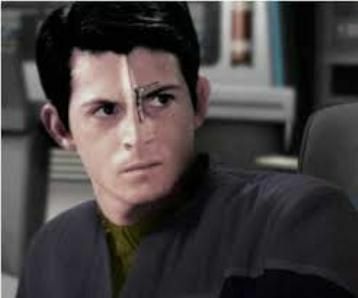 It was suggested that Icheb prepare for the entrance exams by working on the core courses with Tuvok - who had extensive Academy teaching experience - while reviewing warp mechanics with B'Elanna Torres, quantum theory with Harry Kim, and astrometrics with Seven, even though Icheb's knowledge in the former field surpassed that of nearly every Starfleet officer onboard. Because he was a non-Federation citizen, Captain Janeway agreed to support Icheb by writing him the required letter of recommendation. His facility in repairing ship systems and diagnosing problems during a maintenance overhaul of the entire vessel impressed the Captain so much that he was assigned to engineering. Lieutenant Torres was especially impressed by Icheb's brilliance and abilities and to show him her appreciation for his hard work, she invited him to the holodeck for rock-climbing. Not well-versed with Human interaction and the nature of romantic relationships, Icheb mistook Torres' friendliness for flirtation, believing that she was romantically interested in and was coming on to him. He sought advice from The Doctor, which only confirmed his suspicions even more and he became especially nervous when he ran into Tom Paris who kidded him about all the time he was spending with his future wife. When Paris then asked him to join him on the holodeck for a race-car program he planned to run, Icheb thought Paris was challenging him to a typical Klingon ritual competition because of B'Elanna. Confused and overwhelmed, Icheb eventually confronted Torres, telling her that they could no longer "see each other", especially given that she was a married woman. Shocked at what she was hearing, but also realizing that there was no way to convince him that he was just misreading her friendliness, Torres agreed to his proposal. Icheb was also the one who discovered Lieutenant Torres' pregnancy: when he scanned her, he believed that she had been invaded by a parasite lodged in her stomach. After checking the tricorder readings however, Seven explained to him that the lieutenant was not infected with a parasite but in fact pregnant with a child. Before the expectant parents could decide to keep the news private for the time being, Icheb had already informed many of the crew. For his "Early Starfleet History" exam, which he passed, he wrote a thirty-five chapter report on Captain James T. Kirk and his accomplishments. Q junior mocked his work in front of Janeway, saying that Icheb's report made Kirk sound as exciting "as a Vulcan funeral dirge." But Icheb was an agreeable and helpful young man and immediately befriended Q junior, who was staying on Voyager, sent by his father, Q, to "learn about humanity" so he could inspire peace and compassion in the Q Continuum. During his time on the ship, Q junior, who first called Icheb "drone boy", later made up the nickname "Itchy" for him, who in turn called the young Q "Q-Ball" (although Icheb asked him to not call him "Itchy" in front of the senior staff). As part of his lesson plan, Captain Janeway prepared a curriculum for Q junior so he learned respect and responsibility. Instead of doing his own school work, however, Q junior had Icheb write an essay on the Q continuum for him, which he then presented to Captain Janeway as his own work. A mistake he regretted as Janeway immediately recognized Icheb's writing style and called Q Jr. on his blatant deception. Icheb tried not to take Q junior's actions and insults too personally, and the two young men, after taking a piloting lesson together, became actual friends. Things didn't seem to work out for Q Jr. quite as well as he thought. Angry at his father, who felt that he did not live up to what was expected of him, he stole the Delta Flyer II and took Icheb with him. During his stunt, Icheb was seriously injured during an attack by an alien ship. The Doctor was unable to treat him without knowing more about the weapon that caused his injuries. This left Q Jr with the only option left: he returned to the aliens, apologized and took responsibility for what had happened. In the end, it turned out that the whole incident was a set-up by Q to test his son's character. Being satisfied with the results, Icheb was returned to perfect health. Once partial communication was established with Starfleet Command, Icheb passed the Starfleet Academy entrance exam. Icheb was admitted into Starfleet Academy a semester after Voyager's return to Federation space. During his Sophmore year at the Academy he was assigned to USS Voyager to be part of the crew as part of Project Full Circle. With his major of engineering he was assigned to the engineering department under Lieutenant Vorik.